Bock begins with a brief overview of each Gospel, surveying its structure, themes, authorship, setting, and date. He then offers a detailed, unit-by-unit examination of Jesus as portrayed in the Synoptic Gospels, followed by an analysis of Jesus' portrayal in John. He finishes with a summary of the themes found throughout the Gospels, thus unifying them into a cohesive portrait. Darrell L. Bock (PhD, University of Aberdeen) is executive director for cultural engagement at the Hendricks Center at Dallas Theological Seminary in Dallas, Texas, where he also serves as senior research professor of New Testament studies. Benjamin I. Simpson (PhD, Dallas Theological Seminary) is assistant professor of New Testament studies and director of resource development at the Washington, DC, campus of Dallas Theological Seminary. 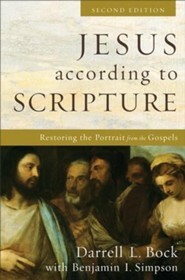 I'm the author/artist and I want to review Jesus according to Scripture: Restoring the Portrait from the Gospels - eBook.